One can choose to focus on bad news or good news. What we focus on determines our outlook on life. Good news 1: Over 250 million people watched and anticipated the last episode of the season for the TV show “Arab Idol” and the winner for this season was 23 year old Palestinian Mohammad Assaf from Gaza whose patriotic songs, beautiful voice, and self confidence made millions spend the money to text message their vote. Assaf, one of millions of Palestinian refugees, was then appointed goodwill ambassador to the world’s youth by the UN agency UNRWA. Last night was a night of celebrations among Palestinians in 1948 areas, in WB and Gaza, and in Exile and indeed among all 350 million Arabs around the world. The dream of Arasb unity still lives on. Good news 3: Good people standing for principles. ‘I was not a party to, and never will be, to the planting of trees on expropriated and stolen land’: Former South African Ambassador to Israel rejects JNF trees planted in his name. Good news 4: Protests continue in Turkey, Brazil and around the world against the new world order that favors the rich and powerful. Palestine remains prominent as a key struggle that exposes the hypocrisy of Western Governments who support colonialism, racism, and other violations of human rights here in the Arab world and even in their own countries (e.g. snooping on USA citizens by their own government). Speaking about democracy and human rights while doing the opposite will not be sustainable. Good news 5: People here (Israelis and Palestinians) are starting to ask important questions about the limits of a militarized fascist society especially after an Israeli Jewish guard shot an Israeli Jewish man for simply saying God is Great (Allahu Akbar). The trigger happy Apartheid society that feigns democracy may yet change and avoid the catastrophic end seen before in history of similar racist societies. Good news 6: Demonstrations are spreading inside 1948 occupied areas (inside the green line) against the Israeli government policies of ethnic cleansing and racism. From the Neqab (Negev) to Jaffa to the Triangle to the Galilee, Palestinians are standing up for their rights. And perhaps one final good news: most Palestinians now realize the failure of the Oslo leadership and its inability to move forward with the needed reforms or to represent our aspirations for freedom and dignity. The subcontractors for the occupation are failing both in Gaza and in the West Bank. The resignation of the last appointed prime minister of WB-A/B (West Bank, areas A and B) shows the futility of trying to save face and not admit to failure of this discourse. The road is clearer than ever: reconstitute the PLO on democratic grounds and let the people decide how and when to return to a liberation struggle. The people demand no less. Send us other good news to share. WELL WRITTEN I LIKE ALL OF THEM BUT YOU KEPT THE BEST FOR LAST AND THAT IS HOW IT SHOULD BE.OUR SELECTED LEADERS HAVE DEMONSTRATED THEIR FAILURES OVER THE LAST 20 YEARS IN WB AS IN GAZA.TRUTH JUSTICE AND PEACE WILL PRVAIL IN THE FACE OF APARTHIED AND FAILED PALESTINIAN LEADERSHIP. POST THIS TO MY FACEBOOK PAGE. Some good news indeed. Well done Mohammed Palestinians need something to cheer about. 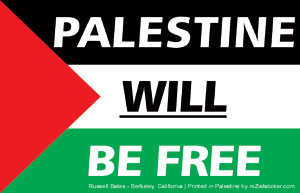 Hi I m an indian, and i want palestine to be free country.. I apeal to the people of Palestine to grow up in each and every field and kick out the israelis from your territorry ..